Did you know it’s not your shoot, it’s your bow that leads to bad shooting? It is needless to say that choosing the best compound bow is of utmost importance. The reason behind that is you have to carry it around on the field for the entire season and then it also determines whether you’ll be successful or not. By a good quality bow, we mean the one that works just as if it is an extension of your arm. We must emphasize this fact that a wrong bow will create a range of different issues. For instance, with excessive draw weight, you can’t draw your bow stealthily or smoothly on your game. Another issue that will arise here is that you might not be able to hold your bow steady. Adequate bow fitting is necessary too because you will experience a lot more difficulty in aiming accurately. In simple words, if you don’t purchase the right bow on the first go then you’re not going to be in the hall of fame. You might realize that there is more to choosing the best bow than just opting for the most popular brand. Choosing the right one can become an eschewing task if you don’t know what your needs and requirements are. Therefore, we’ve reviewed the top 10 best hunting compound bows and also prepared a detailed buying guide for you. So let’s begin with the top 10 comparisons! Does your kid or spouse is interested to hold a bow or join you on the hunting ground? The use of Leader Accessories compound bow is the best solution for the beginners. The manufacturer presents aluminum riser and the weight of draw is 30 to 55 lbs with its length about 10-inch to 29-inch. The overall weight of Leader Accessories compound bow is only 3.3 lbs. That is the reason; it is easy to hold bow especially for beginners. Later, if you want to upgrade your bow with its accessories, you can do so. However, keep one thing in your mind this can be done without a glitch. This model is only accessible for right-hand shooters. The axle-to-axle length is 28-inch that makes it a compact choice for the hunters. All hunters either they are male, female, or kids can use this Leader Accessories compound bow. You can adjust both length and weight according to your requirements. In addition to that, a good variety of camo, as well as color variation, is accessible and you can choose the one you like. For the advanced shooter, the manufacturer also equipped this compound bow with a dual cam system. It offers decent velocity with the maximum speed of 296 FPS (feet per second). Therefore, if you want to hunt you can bring it with you in the hunting ground. The Leader Accessory is the full-customized bow that works according to users requirements because you can adjust the draw length and width. This compact designed and lightweight bow helps to upgrade your skills. Diamond Archery compound bow comes with essential accessories and no need to purchase it separately. It is more versatile, efficient performance, budget efficient, and a durable hunting bow. The 7-inch brace height is ideal and flexible to handle all situations. Many hunters use this model of bow for practice because it is a solid choice. You can also use this long-standing traditional bow to do other activates. Aluminum components provide a durable model while keeping its weight comfortable i.e. 3.2 lbs. The quality of the string is reliable because Octane created it with his hand. The seasoned hunters will find it useful. No need to worry if you are left-hander archers, it is suitable for both left and right hand and all age hunters. Novice can polish their skills, achieve their goals, and enhances their experience in the field of hunting with this bow. If you are looking for a flexible bow then the Diamond Archery presents the versatile Infinite Edge Pro compound bow for you. Multiple features and included accessories extend their durability and usefulness. It is perfect for hunting, archery, target shooting, and more. iGlowhas manufactured a cost-effective bow for beginners. It allows the hunters to adjust the draw weight of this bow according to your requirements. It is not chosen due to the low price tag but it offers plentiful useful features to target shooting. However, your purchase comes with a premium kit. The kit includes Allen keys, rubber stabilizer, D-loop string, tub peep 1/8-inch sight, brush arrow rest, bow sling, and optic sight with light. This compression-molded limb presents an excellent performance with precision accuracy. It is accessible in eight different colors on the market. Furthermore, the manufacturer uses fiberglass material to construct the powerful bow that launches the arrow at the speed of 296 FPS. This high-quality material enhances the durability and reliability of the compound bow. If you want to upgrade your hunting bow to enhance the performance, you can use multiple accessories at a great price. You can also do medium game hunting with this lightweight compound bow. The iGlow compound bow is qualified as the best-suited traditional bow because it is constructed by using carbon, aluminum, and fiberglass materials. That is the reason; it provides an effective way to shoot with high accuracy. The Bear Archery compound bow for hunting comes with enhanced features for target practice. You do not need to purchase the extra accessories because it is a full-featured bow. It also offers superior velocity as compared to other brands and models. The EnduraFiber material is used to make the limbs of the compound bow. This material provides extra flexible limbs that make the use easier for you. The Novice hunter will also achieve great results in a shorter time. On the other hand, the seasoned hunter will get it so easy to use and achieve their goals with more accuracy. The vibration and noise is another important feature that makes it suitable for hunting. The manufacturer uses the Shockwaves technology to present the limb boot design. It clutches the limbs in place; therefore, no vibration and noise occur when your bow releases the arrow. Although, it is a specialized bow it is not useful for other activities. The specialized bow feature makes it unique as compared to others on the market. 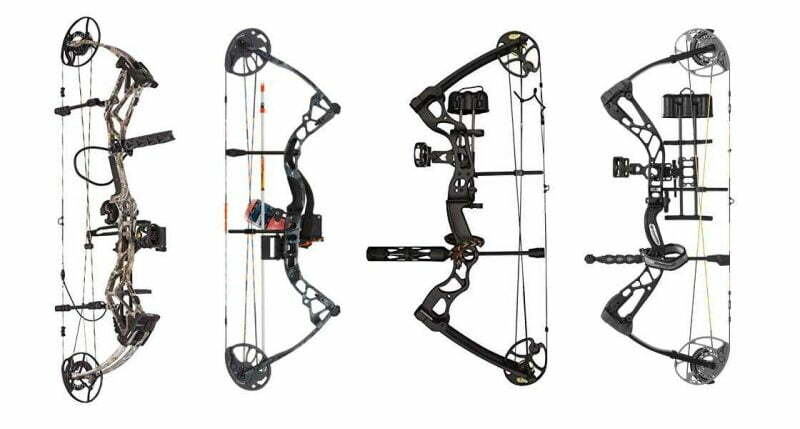 If you are looking for the specialized hunting bow then purchasing the Bear Archery compound bow is the right choice. This right-hand bow offers high efficiency, fantastic reliability, and capable of reducing vibration and noise. Do you want to develop the skills in archery? Then purchase the ideal Southland Archery Supply (SAS) compound bow that proves to be the right gear of durability and reliability to the shooters. The manufacturer has used high-quality material to make it durable. The best part is … it accepts all upgrades and standard parts. However, it is accessible in cheap price but it does not mean it comes with low quality. The durable limb, inexpensive fiberglass, and multiple other features present the parallel designed bow to you. The aluminum riser offers a soft base to rest and target your arrow. It is also featured with a dual eccentric system. The durable aluminum cam construct allows you to adjust the draw length according to your requirements. Although it is a little bit louder you can resolve this issue by upgrading it. You can use dampening kit with your bow at a reasonable price. Another benefit of using dampener in your SAS compound bow is to stabilize the string. It provides an accurate and smooth shot in the hunting ground. The performance of this powerful bow is excellent and offers a maximum 270 FPS speed. It comes with a stylish and sleek design that makes you look like a professional archer. The Southland Archery Supply presents the inexpensive but durable compound bow. The fiberglass, plastic, and heavy-duty aluminum materials are used to construct it. Limbs of the bow come with a parallel design that helps to offers plenty of support and balance. Do you want a compound bow with a complete kit? Raptor presents the ideal compound bow with a complete kit and much more. All components are constructed by using heavy-duty materials that make it more reliable and durable. The shooter can adjust the draw weight and length according to their needs. Complete kit consists of a pin sight, an arrow with a whisker biscuit, which come with level, light, and a stabilizer. Furthermore, the peep sight is already configured on the bow, so there is no need for complex assembly. Since it is a complete package of needed accessories so you don’t need to spend additional money on upgrading it. The one thing that you have to purchase is, the arrows, otherwise, all parts are included. You can enhance your fishing, hunting, and other related skill by using Raptor compound bow that comes with handy accessories. Are you a beginner in the field of hunting and getting confused to purchase your first bow? Go for the Raptor, you’ll get bow hunting kit with a complete range of superior quality accessories. Bear Archery manufactured the superior versatile compound bow that comes with outstanding accessories to make the hunter’s life easier. It is created to fulfill all the need of hunters regardless of age and skill level. The advance grip design helps to remove hand torque for improving accuracy level. This lightweight model of compound bow offers 315 FPS as a maximum velocity that presents superior performance. Moreover, the support and balance it provides also give you superior performance. The manufacturer uses the EnduraFiber material to construct durable limb that impresses the hunters. The flexible limbs enhance the hunting experience of each hunter. Cruzer G2 is accessible for both left-handed and right-handed shooters. Furthermore, it allows you to adjust the draw weight and length as per your requirements. You can do all the adjustments by using an Allen wrench. This model of the bow is ready to hunt and comes with 06 Trophy Ridge accessories. The Cruzer G2 compound bow offers fantastic adjustability whether you have purchased it for a teenager, adult, or expert. Plenty of traits make it best compound bow for hunting such as noise reduction, grip design, particular limb, versatile, and high velocity. Topoint compound bow comes with a complete needed package for hunting at an affordable price. The durability and accuracy level make it most popular compound bow on the market as compared to other bows. You don’t have to buy any accessory separately because it comes with all essential components such as quiver, arrow puller, rubber stabilizer, bow stand, carbon mix arrow, brush arrow reset, and more. The manufacturer has used heavy-duty material to construct this compound bow. The aluminum riser and use of other imported material offer composite and smooth touch grip design. It allows you to shot at the speed of more than 320 FPS. The bow allows you to adjust the draw weight and length according to your skill level. Furthermore, you can start shooting by using included arrow quiver and carbon mix arrow. This will defiantly give you an excellent experience in the hunting field. This lightweight and compact compound bow deliver high-velocity shoot with accuracy. You can choose from a range of five different trendy colors such as black, black camo, forest camo, muddy girl, and snow camo. As a beginner, you can use the Topoint compound bow since it comes with all the important accessories that are needed for hunting. You don’t need to spend additional money on hunting. The aluminum risers, fiberglass limbs, compression molded, and string suppressor provide excellent performance. You can also adjust the draw length and weight according to your skill level. Your purchase comes with a complete elite kit. The kit includes 5-pin optic bow, bow sight with light, aluminum stabilizer, drop away arrow rest, tube peeps 1/8-inch sight, bow sling, D-loop string, Allen keys, and Lube wax. This versatile bow gives you an excellent hunting experience. You can shoot with accuracy at the speed of 310 FPS. It is strung and preconfigured therefore; you don’t need to worry about its assembling. You just have to hold your required components and use them. It is accessible in fifteen different stylish and trendy colors. The two important factors arrow rest and sights directly enhance the accuracy level. Archery40-70 lbs compound bow by iGlow delivers excellent performance. Now you can shoot your target with precision and can adjust the draw weight and length according to your requirements. Barnet has designed this versatile compact bow according to AMO and ATA standards. This lightweight archery bow comes with plentiful innovative features that give you outstanding hunting experience. But there is a catch … you can use nock point in this bow for an accurate shot. This nock point is especially placed on the bow for the new hunter and for kid shooting. Moreover, the manufacturer permits you to adjust the draw height and length according to your hunting requirements. This draw adjustable module provides an easy and quick way to use the bow for hunting. Vortex compound bow for youth comes with a complete kit. It includes a bow arrow holder and three arrows. This kit is ideal for the kids who want to join their friends in the hunting field. The right-handed hunter can enjoy accuracy shoot along with superior other performances. The company gives you limited 5-years warranty as well. Barnet compound bow is specially designed for the beginners who aren’t skillful in the hunting field. The nock point makes it unique because it helps the kids to shoot with accuracy. You can also adjust the draw weight and length according to your wish. The first thing that we would like to mention here is that we are a team of avid outdoorsmen and bowhunting is something that we do all the time. We have used different types of bows including recurves, compounds, and others. So a panel of experts is already here. However, we didn’t hold our horses there. We have also discussed a lot of bows with our hunting peers. We have gone through a number of online reviews to understand what people felt after using a particular bow. We haven’t focused on brand popularity in our top 10 list and for this reason; you might haven’t come across some of the brands that we have mentioned above. Compound bows are a pretty sophisticated weapon and only a slight issue can result in a serious problem. The thing is we have developed a list of top compound bows that real bowhunting lover prefers to use on the field. So we have put in our own experience, a large number of online reviews and the information that we extracted by interviewing our hunting peers to develop this list of top 10 best compound bows. There is a complexity associated with compound bows which draw many people towards them. These bows are far more complicated than recurves and longbows. For this reason, first-timers don’t go for this particular bow. 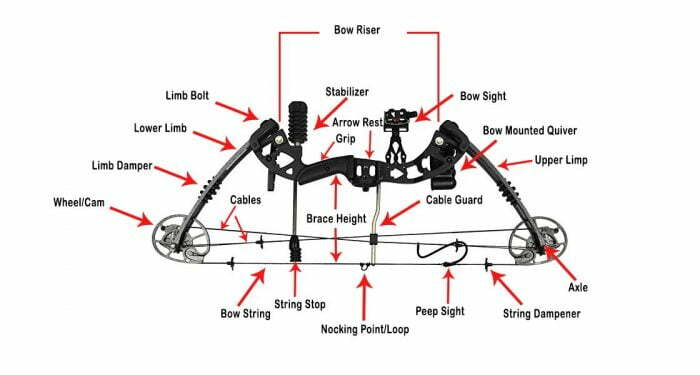 A compound bow features a variety of parts. One of them is the riser which is the middle part of your bow that features a grip. The sight along with the arrow shelf is also connected with this riser. These are made of carbon or aluminum. Stabilizer and quiver are also connected with the riser. Limbs are the flexible planks made of fiberglass and they are present on the top as well as at the bottom of the bow. These limbs are connected with the riser and have all the energy that you get by pulling back the bowstring. You’ll find different styles of limbs. The solid limbs are a single piece of fiberglass. On the other hand, split limbs are two pieces connected with the riser. Split limbs generate less shock and are more durable than solid limbs. Then there are parallel limbs that are gaining more and more popularity these days. Parallel limbs are quite and they don’t generate much recoil when you release our bowstring. Now, connected with the limbs are the cams which can either round or oval. These cams are the real feature that differentiates a compound bow from other bows. As you pull back the string it becomes more difficult to pull it. The purpose of these cams is mechanical manipulation of the bow’s draw weight as you are pulling the string back. Past a certain point, it will become a lot easier to pull back. This happens even if you keep the same energy stored as in the case of a traditional bow. As mentioned above, there are different types of compound bows. And they vary in terms of types of components used in their construction. Choosing the right one that serves your purpose can be an irksome task. Therefore, we have developed the list of various considerations that you need to keep in mind before you consider a compound bow for purchasing. As a hunter, speed is a dominant factor that goes through your mind. About a decade ago if a bow’s shooting speed was 250 FPS then it was considered to be the best. However, with the technical advancements, some of the bows now are capable of shooting 370 FPS maximum. The jumped string is one of the issues that most bowhunters have to deal with. In the field, a hunter always thinks that the bow should have been faster, more precise and with the lower arc. But speed is not everything! There is one factor that you need to rate higher and that is accuracy. Brace height is an integral factor in accuracy. It is the measurement from your bow’s grip to where you place the arrow on the string. If the brace height is taller it will be far easier for you to shoot. However, you will have to compromise on speed here. More shooters find 7-inch to be the perfect brace height. 8-inch bows are considered to be best for competitions while 6-inch bows are considered as speed bows. Anything out of this range is thought to be for the special purpose bows. Just like speed, weight also depends upon the purpose of your bow. If you do bowhunting for target shooting or recreational purposes then you can opt for a heavy bow. Just set it down and make your shot. If you do hunting then keep in mind that you’ll have to carry your bow around the field. And then there are your arrows and all other stuff! You’ll find it very difficult to carry around your hunting gear for the howl day and then hold your bows to full draw when making shots. Pretty exhausting, eh! Keep in mind that when a bow manufacturer is talking about the weight of a bow, they are actually talking about its dry weight. They are not accounting for weights of sights, rest, arrows with broadheads and of course the quiver. A small tip for you here is to practice with your quiver filled with arrows. You should also install all the gadgets on your bow and then go for practice. During the crunch times, your muscle memory will come in to play its role. However, the thing to keep in mind here is that if you are shooting within 34 to 40 yards then quiver’s weight is not going to matter a lot. But it will have a significant effect if you are shooting for more than 60 yards. This is the mechanical relaxation a bow can achieve while it is in full draw. Let-off is measured in percentage and it is normally similar to the top draw weight of your bow. For instance, if you have set the bow at 60% this means that when you draw it, the bow is 60 lbs. However, when you get near the full draw its weight will reduce. It will enable you to draw at full length and hold it there for a longer period. Therefore, it is a powerful invention that provides you with enough valuable time to take the aim perfectly without any shaking. It contributes significantly to increase the aim. This is the primary reason why you are using a compound bow in first place. If you are looking for a higher percentage than 60% then you will get less fatigued and will also exploit more hunting opportunities. Some states don’t allow you to go over certain let-off percentage. Therefore, you need to keep this thing in mind as well. When you know your draw length precisely, your options and considerations will narrow down significantly. Draw length is your wingspan or your arm’s length and it will contribute to keeping you comfortable when drawing. Too much draw length will extract the maximum poundage from your draw and will put it behind the bow which will make your shots inconsistent. The short draw also complicates things because you will have to bend your forearm to bring the anchor spot close to your jaw. The recent models of compound bows allow you to make adjustments to the draw length from 15 to 20 inches. Other models use cams or different machines to alter the draw length. You can get your bow adjusted for draw lengths from a pro-shop. But you can also do it yourself by following this technique. On the other hand, with draw-weight, not all bows are versatile enough. Most of the bows are only capable to make adjustments of up to 10 pounds only. For instance, you can find a bow that will come with the least draw weight of 50 pounds and the highest of 60. For the new drawing weight you will have to make adjustments to the limbs or cams. But there are some compound bows that allow you to set the draw weight anywhere between 13 pounds to 70 pounds. To align with the draw weight you must also have the matching arrows. You also have to keep an eye on state regulations because different states have different rules for maximum and minimum poundage of draw weight. Some people don’t give much importance to this integral factor. They are excessively focusing on other factors. For those of you who don’t know what axle to axle length is; it’s the distance between the two cams on both limbs of a bow. So essentially it’s the total length of a bow measured in inches. A very short compound bow will have this length measuring to be 30-inch while its long counterpart will be 38-inch. Short bows are easy to maneuver and are light in weight as compared to the long ones. You will find these bows a lot more convenient when shooting in tight corners like tree stands, ground blind or under thick cover. However, these bows are less forgiving and more challenging when it comes to accuracy as compared to longbows. Therefore, most hunters opt for the medium axle to axle lengths. Going for the right handed or left handed bow is more of an assumption than anything else. You should assess yourself under a coach and let him decide which bow you should choose. Some right-handers prefer left handed bows and vice verse. You need to be in good form and excellent shape if you want to shoot accurately not the hand. Compound bows come with wheels on the end of their limbs which are called cams. These cams make it easier for the hunter to draw easily by utilizing the mechanical benefit of pulleys. However, these pulleys don’t do much to reduce the draw weights. With the help of eccentric cams, the bow designers are able to boost the force-draw of a bow close to its peak before the full draw. These cams can reduce the draw weight rapidly when max draw length is reached at let-off. Cams come in different types including hard, medium and soft cams. The types refer to speeds at which the drawing weight can rise and fall. Soft cams are the smoothest of the three but they also offer the least amount of arrow velocity. Hard cams are tough to draw but offer a good arrow velocity too. Medium cams work right between the other two. This design only involves a cam one of the limbs. The other limb features a circular wheel. When you draw the bow the solo cam will work to control the timing of the limb tips well synced with one another. Your arrow’s nock will always travel in a straight line because this design doesn’t influence the tiller adjustments or the string stretch. Solo cam design is the most consistent of all but it is the slowest as well. A compound bow with dual cam design has a cam on each end of the limb. This cam design is much faster than its solo counterpart but you have to keep both of these cams in perfect synchronization too for high accuracy. This cam design is a modification of the 3-grooved dual cam construction. Here the cams are enslaved to each other instead of the limbs of the bows. This construction creates a free-floating system where the cams can automatically adjust to any differences in timings. This is your self-rectifying cam design. There are a couple of asymmetrically elliptical cams. The top cam is in control while the bottom cam powers the shot. You will get a straight nock with such a cam construction without having to deal with the sync-issues just like in the dual cam. But you will have to time the synchronization initially. Sights enable you to gauge how high you need to hold your bow while accounting the distance to cover. There are different types of sights that you need to consider as well. From 7-pin to floating ones there are limitless options for you to explore. 7-pin is best for still hunting while floating pins are better for tree stands or ground blinds. You need to focus on your hunting style before you pick a sight. It is an attachment on your bow that holds your arrow in the exact same spot each time you draw your bow and shoot. The traditional models didn’t feature these rests and the hunter had to hold the arrow while shooting. There are mechanical rests, whisker biscuits, and drop-aways. You can choose any one according to your preferences. Barnett is among the pioneers of the bow hunting with many of their innovations and technologies featuring for the first time in a bow design. The company has contributed significantly to create a number of designs and styles that we are accustomed to seeing today. Barnett started its operations from the EU and eventually came to the US after the growth of archery in this region. Bear Archery is an American company that has a long history associated with archery. It is one of the most reliable brands when it comes to compound bows. It came into being back in 1902 and it has an incredible amount of knowledge to use in the construction of its bows. The company offers a long list of compound bows to choose from and their bows are extremely precise and well built. SAS or Southland Archery is southern California based business that also has a full range of compound bows. They have been around for over ten years now and they field test each of their weapons before they selling it. If budget is your concern then you need to consider buying SAS bows. They do make low priced bows but like Diamond Archery, SAS also doesn’t throw quality out of the window. Diamond Archery is a sister company of Bowtech with a focus on low prices compound bows. However, a low price doesn’t mean that Diamond archery compromise on quality. The bow designs of Diamond Archery are exactly the same as that of Bowtech. The sale difference is that Bowtech bows feature binary cams while Diamond bows have solo cams. Diamond bows are not sold directly and you will have to find a dealer. Raptor Archery is all about traditional bowhunting. An all the traditional bowhunters consider it to be a lifestyle instead of a part-time fun or a hobby. The company also feels the same way. They have a full collection of all the primitive archery accessories for a true traditional bowhunter. What does the term “brace height” mean? Brace height is critical for accuracy. You can measure it from the grip of your bow to the position of your arrow on your bow’s string. High brace translates into easier shots but with less speed. Most of the compound bowhunters go for 7-inch brace height because it provides a perfect balance between speed and accuracy. 8-inch high brace is best for competitions whereas, 6-inch high braces are for speed bows. How does draw length impact accuracy? In simple words, draw length is your arm’s length or wingspan. Your arms need to be comfortably stretched and positioned when you are at full draw. Excessive draw length will put most of the poundage from your draw at the back of your bow and your shot will lose accuracy and power in impact. On the other hand, short draws bend your arm so that that you can bring the anchor close to your chin. This way the base of the bow gets unstable which results in inaccuracy. What draws weight range do you need for a compound bow? If you want to use a compound bow for hunting purposes then you need as much draw weight as you can handle. As mentioned above, most of the youth, as well as females, prefer to go for a draw weight that ranges between 45 to 50 lbs. On the other hand, most male hunters prefer to go for draw weight that ranges between 60 lbs to 70 lbs. What is the fastest shooting compound bow? At present, the two of the fasted compound bows available on the market are Full Throttle by PSE and RPM 360 by Bowtech. According to the standards set by IBO, the RPM shoots at 360 feet per second. This speed goes up a notch when we talk about the Full Throttle compound bow. This bow can shoot at 370 feet per seconds which is currently the highest recorded for a compound bow. The effective range is the shooting distance that a bow or the hunter can hit comfortably. Some of the hunters will not dare pass 30 yards while others frequently try to reach the 40-yard barrier. A compound bow can easily shoot and deliver a lethal blow 60 yards away. This means that these bows are the best weapons that you can use to hone your skills in distance hunting. What is the speed of an arrow shot from a compound bow? IBO Speed is the unit to measure the speed at which a bow shots an arrow. As mentioned in the beginning, there are some compound bows that can shot an arrow at 370 FPS (feet/second). A traditional bow can only reach about 180 FPS at maximum. There is a significant amount of speed difference between these two types of bows. However, compound bows are popular because they offer accuracy and speed. Speed and accuracy stay in everyone’s mind but one thing they all tend to forget about is form. If you are in a good form then brace height is not going to matter a lot. From comes with practice and this improves your accuracy. With accuracy in your corner, you will only focus on speed which you will get from smaller brace heights. So it is important to focus on practice if you want to achieve accuracy and after that focus on brace heights. Now it’s time to declare a winner, the best compound bow that you can use for bowhunting is the one from Leader Accessories. One of the best features of this bow is its very convenient price. Most compound bows come at a high price because of their accessories and add-ons. But this is this not the case with this bow. This bow can provide you with a draw weight that ranges between 30 and 50 lbs. For this reason, it is best for the youth and females. Small framed men can also use it effectively. Furthermore, you can adjust its draw length from 19-inch to 29-inch. It can deliver shot at 296 feet per second with a let-off of 70%. Its brace height is 7-inch and axle to axle length is 28-inch. The riser of this bow is made of aluminum. Moreover, the bow also comes with a 1-year warranty. There is no doubt that compound bows are highly effective weapons. But you must also learn how to use them with efficacy. The tool will only come in handy if you have properly-honed skills at your disposal. For this reason, you need to practice a lot if you want to be a successful hunter.